Discerning, eclectic, eccentric.....welcome to Rose & Brown Vintage. We burst onto the vintage scene in 2007, with The House of Rose & Brown Vintage Boutique and later with Rose & Brown Vintage Home, both in Saltaire, West Yorkshire. Both shops have come and gone, but our events, including the Saltaire Vintage Home & Fashion Fair, established in 2007, are still going strong. We are devoted to genuine vintage, and dedicated to organising quality events with a reputation for great customers, superb stallholders, lovely venues and a brilliant atmosphere. The Great Seaside Vintage Fair, held every July since 2011 at Whitby Pavilion is a perfect example – and it's a vintage fair with a sea view! We run regular Fairs in Saltaire and Whitby and Leeds, and events organised at the request of Leeds Museums & Galleries, Bradford Council and other organisations. At our vintage fairs we offer you the chance to find the most wonderful original things from past eras. Dedicated to true vintage since 2007. 2019 is already proving to be a vintage year! Big thanks to everyone for helping to make our ever-popular Saltaire Vintage Home & Fashion Fair on Sat 30 March in the beautiful Victoria Hall in Saltaire, West Yorkshire, such a storming success! Outstripping last year's footfall, and with 48 stalls of brilliant genuine vintage from the 1920's to the 1980's, it was a proper vintage event! We're really looking forward to our next fair - a totally fresh initiative, we're calling it the next generation of vintage fairs! Vintage @ LS28 on Saturday 1 and Sunday 2 June 2019, in the Old Woollen at Sunny Bank Mills, Farsley, Leeds LS28 5UJ from 10.30am to 4pm each day. An amazing industrial setting, a DJ playing soul, funk and indie on vinyl, a bar and lounging area, and an innovative mix of selected vintage fashion (including menswear), records, books and vintage toys. A fair like no other. Come and spend some weekend chilling time and see what goodies you can buy and take home! £2 entry on the door. Under 16's in free. Dog friendly. Keep up to date with us by following us on Twitter, or 'Liking' the Rose & Brown Vintage page on Facebook. We may have finally submitted to the 21st Century, but we're still vintage through and through! Brand new event! 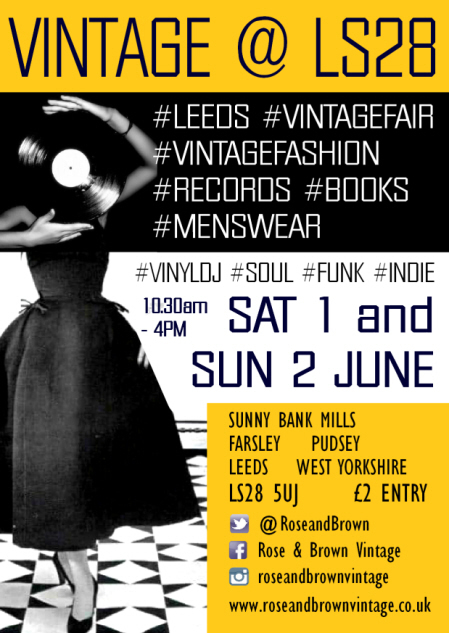 The next generation of vintage fairs - Vintage @ LS28 on Saturday 1 and Sunday 2 June at Sunny Bank Mills in Farsley, Leeds.